used to read Mills & Boon romances around 2 decades back. My male friends used to make fun of me for reading those mushy mushy girly novels and my female friends used to lend me their favourites. In those days everyone used to say that if you read one M & B you need not read the second and if you read the second, you could easily write the third. I know that's easier said than done, and I'm glad Sundari decided to write this one. 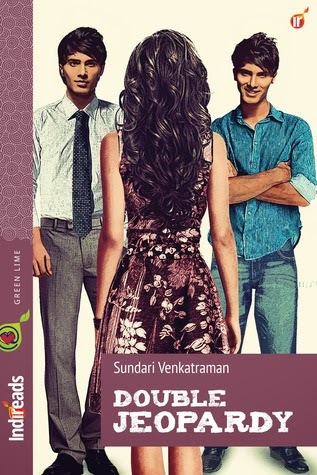 Frankly, I began Sundari Venkataraman’s Double Jeopardy expecting the same run-of-the-mill boy and girl stuff. But I wasn’t ready for what I got. Society has changed, and so has today’s romance novel, of which ‘Double Jeopardy’ is a living example. It weaves a romantic tale of three individuals, Sanya, Arth and Ansh, and their dreams and ambitions in a world where the male is no longer the alpha male and the dreamy-eyed young woman has to grapple with the realities of a city which is quite different from what it was ten years ago. Arth and Ansh are identical twins with differing personalities. Sanya hates Ansh for his brashness and loves the ever-so-caring Arth. Her feelings keep on growing in her subconscious even after she has to move to London with her parents. Unable to forget Arth even after a long gap of ten years, she returns to Mumbai, confident that Arth will reciprocate her feelings. Her detestation for Ansh resurfaces the moment she sees him at the airport, but he surprises her with such charm and elan that she wonders if this was the same Ansh who once treated her with contempt. Arth, on the other hand, has become a workaholic and hardly has time for Sanya. At one stage the story tapers into a typical triangle -- Sanya longs for Arth but is unable to resist Ansh; and Ansh takes full advantage of Arth’s absence to flirt with Sanya. This debut novel, however, has the reader in for an unexpected twist and it is this twist that gives the novel its usp. As a reader, I could completely identify with Sanya’s motivation to return to Mumbai to find the love of her life. Ansh’s sudden soft corner for Sanya had me perplexed and I longed for Arth to reciprocate Sanya’s affections. The writer has played with the three characters extremely well to make the book a page-turner. However, I felt that after the suspense is revealed, everyone except Sanya accepts the situation without any resistance. There should have been a storm before the calm, some deeper introspection by the supporting characters as the question here is one of uprooting centuries of a set of beliefs. Especially as there was enough space for the writer to explore more, one is left with a feeling that a lot was left unsaid. It could have made a full-fledged novel instead of a novella. Sundari’s writing style is more visual than verbose, and I imagined Deepika Padukone as Sanya, and the Ranveer Singh as the twins. I wonder who you prefer to see as those three characters? Wonderful Review Neelesh. Except the actor part being distributed :) Salman defintiely :P But the insight you have put to the story is wonderful. This is one story where you really felt bad after it was over. Well a BIG thanks to you for two reasons - first for initiating this movement, and second for being the first to post a comment on my blog. The actor part was added just before I uploaded the review. And if anyone reads the book after reading, I'm sure they're going to visualise their own fav actors & actresses. I believe it should help them enjoy the book more. I didn't mention it to Sundari, but I think this one can even have a sequel. As for it being a novella, I agree that it should have been much longer. We live and learn. Rubina has been telling that to me from the moment she read it actually. Just one thing though. Sanya is shocked by the truth because she has just found it. The rest of the characters already know it and that's why I did not bring their reactions into the picture. I had to squeeze the whole thing in that newspaper article. If it had been a novel, I would have definitely gone in flashback and told the whole story. Will keep this point in mind if I ever decide to convert this book into a full-fledged novel. It has been a joy the past few days and a few more days into the future of course - interacting with so many bloggers and getting an honest feedback. 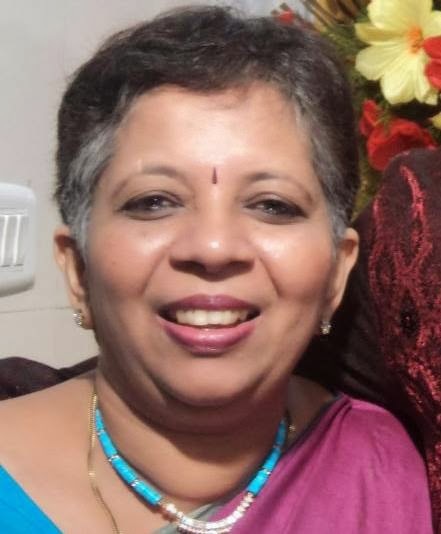 Neelesh, you can become an example to men, to take romance novella/novels/stories seriously & not dismiss it as chick-lit. Nice review. You have summed up the entire story perfectly & given your opinions too. Deepika & Ranbeer Singh, now you have my imagination on a roll too. Hope to read this one by Sundari soon. Thanks, NAV. I don't think many men would care to follow me. Basically I love reading, and I disregard any reservation policies as far as books are concerned. Literary, Sci-fi, Romance - if it's a good book, I enjoy reading it.